Imagine a customer who presses the start button of a new device five times in a row, facing trouble in operating the device, could be offered a real- time support chat or an instructional video via their mobile device or a screen on the product itself. A toothbrush guiding consumers on how effectively they are brushing their teeth and when do they need to change it. A fridge which is the focal point of many households helping the marketers to collect consumer data based on the storage pattern of consumers. Though it sounds impossible but the latest digital trend which has had the biggest hype over the past year i.e IOT is making it possible in forthcoming years. And why not?? According to Cisco, about 50 billion devices will be connected by 2020, turning this into a reality. The IOT is the idea of physical objects, devices, or even people being connected to one another and to the internet. It has the ability to change how everything physical in our life works. In essence, it refers to everyday devices that are able to automatically exchange information over a network. More and more devices are being built up with Wi-Fi and sensor technology. As the internet becomes more widely available throughout the world, costs associated with technology are decreasing. These devices that are effortlessly sharing data include fitness wearables, cars, lamps, smartphones and many others. 1. Rolls-Royce: Rolls-Royce has embedded jet engines with sensors that transmit real-time data about their condition, allowing them to be monitored and maintained remotely. This turns a physical product into a connected information service. 2. Hilton hotel chain: is rolling out smartphone-based check-in and room key functionality across its entire portfolio of 4,000 plus properties. This combines visible innovation in the front-of-house service experience with more efficient back-end operations. 3. Mc Donalds: McDonald’s partnered with Piper, a Bluetooth low-energy beacon solution provider, to greet customers on their phones as they enter the restaurant. Through the app, consumers are offered coupons, surveys, Q&As, and information about employment opportunities. McDonald’s get out lots of data out of it. When customers enter comments, their feedback is routed to the appropriate manager who can respond to the request before the person leaves. 4. Tesla Motors: When Teslas wall chargers were overheating Tesla just updated the software of each car effectively eliminating the problem in all of their products. As reported by Altimeter, a customer recently submitted a request for a crawl feature that allows the driver to ease into a slow cruise control in heavy traffic. Tesla added this feature to their entire fleet of cars with just one software update. 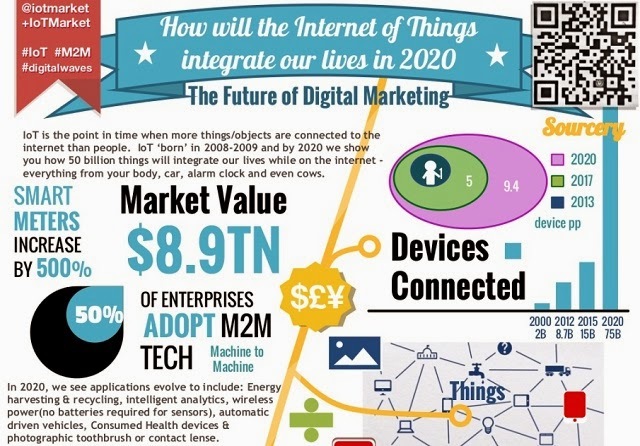 IOT has an enormous impact on the way marketers think. The concept of IOT is increasing the number of digital channels providing more tracking features. The increased volume of data will give vast opportunities to the marketers for tracking and analyzing prospects and customers ultimately allowing marketers to create personalized marketing strategies. The value of data is lost when it’s not analyzed and used at a proper time. Marketers and R&D department invest in crores for data collection. For especially large companies capturing, managing and analyzing data is of utmost importance. IOT can make it much simpler. With the help of smart devices, we can have all the information pertaining to every sale (location, demographics, reason of purchase, etc. ), details regarding every social media page/webpage (areas with high traffic, age group, location, time of surfing, etc.). All these can be achieved in real time. This would save much of the R&D costs, would require decreased workforce and the promotions could be directed to a specific segment and that too in real time. An instant feedback at the same time will also lead to instant solution with the help of IOT. It would be possible to make every second of every day count towards resolving issues and serving them the right information that will nurture them to ultimately close a deal. The devices would now be able to measure its own performance and regularly maintain and diagnose. Currently we have self-diagnosing signals which is a clunky method; like in automobiles, smart phones, Televisions which gives inexact signals. These devices within seconds of such signals either malfunction or stops immediately. With power of IOT, this down time can be eliminated and the device itself would be able to upgrade or replace itself. It will also search for new software installs and upgrade it whenever most needed without human intervention. The customer doesn’t have to wait for the company personnel to come and fix their machine. For a Digital Marketer social media is an important platform to get connected to target audience. When FB and Twitter was innovated marketers did not think that such social media sites could be used as a port of branding and marketing. Today social media sites are like a soul to marketers. Today automated posts and notifications which are generated by n number of devices connected to internet gives a clue that future is not far when IOT will play an important role with respect to social media. IOT devices connected with social media will allow marketers to identify and take advantage of its peculiar characteristics. Imagine a 100% CTR leading to 100% ROI invested on banner ad. IOT can make it possible by tracking the reader’s behavior and showing only relevant banners and popups. No longer the marketers have to be dependent upon the stale ads and irritate the customers. This will bring a new world of advertising where both the marketers and consumers will experience change. An assumption that, the era of interruptive marketing can slowly vanish would not be wrong. An age where the marketer will have a constant watch on customers behavior(without interrupting them) can any time improvise the advertising strategies and their products or services. Advertisement will have 100% chances to align with their interests, behaviors, and past purchases. As increasing numbers of our once-unconnected devices and objects are being fitted with sensors with the help of constant network accessibility, the possibility increases. The brands will be able to process the customer’s information and personalize them. There may also be the need for an increase in data analyst roles in marketing departments. There are high chances where customers can find it highly intrusive. Marketers will know us more than ourselves. The subject of concern will be “Am I being monitored 24x7? ?” It will be important for marketers to come with different strategies in order to tackle this problem like incentivizing or benefitting them with various offers. This will also be a challenge for the developers to come u with more security features with any IOT application. The concept of “INTERCONNECTEDNESS” as far is not vague. Its reality and marketers are spending hugely on R&D predicting the bright future of marketing with IOT. The win-win concept where advertising can be positioned as a need to customers is possible to a great extent via IOT.